You can also reach out to us at aii[at]usc.edu. Inclusion in the Director’s Chair? The annual report from Dr. Stacy L. Smith and the Annenberg Inclusion Initiative, Inclusion in the Director’s Chair, was released on January 4, 2019. The study examines the gender, race, and age of directors across 1,200 popular films from 2007 to 2018, revealing for the first time an increase in the percentage of black directors hired to helm top-performing movies. The report also explores gender in the executive and leadership ranks at major media companies, and gender and race/ethnicity of producers and below-the-line crew across 300 top films from 2016 to 2018. The Annenberg Inclusion Initiative has released a new report in partnership with TIME’S UP Entertainment, titled “Critic’s Choice 2.” It is the second from Dr. Stacy L. Smith and the USC Annenberg Inclusion Initiative to investigate inclusion among film reviewers and examines access and opportunity for film critics. The report uses reviews of the 300 top-grossing films from 2015-2017 posted on the site Rotten Tomatoes to assess gender and race/ethnicity of critics, finding that reviewers are overwhelmingly white and male. The USC Annenberg Inclusion Initiative examined the gender and underrepresented racial/ethnic status of leading characters across the 1,200 top films from 2007 to 2018. The results are good news for the industry, as the brief charts an increase for female leads/co-leads, underrepresented racial/ethnic leads/co-leads, women of color, and women age 45 and older. Across the 100 top-grossing films of 2016, 47 did not feature a single Black woman or girl speaking on screen, 66 movies were devoid of Asian female characters, and a full 72 films erased Latinas. Very few females from the LGBT community, native and indigenous females, Middle Eastern females, or female characters with disabilities are seen in our cinematic stories. More generally, the percentage of females on screen in film has not moved in decades. It’s time to change these statistics. The inclusion rider was created to do just that. The inclusion rider is an addendum to an actor/content creator’s contract that stipulates that stories and storytellers should look like the world we actually live in — not a small fraction of the talent pool. It does this while also protecting story sovereignty. In October 2016, Dr. Stacy L. Smith, the Founder and Director of the Annenberg Inclusion Initiative, delivered a powerful TED Talk on the prevalence and portrayal of female characters in film. Most importantly, she shared her data-driven solutions to the problem. Watch now! 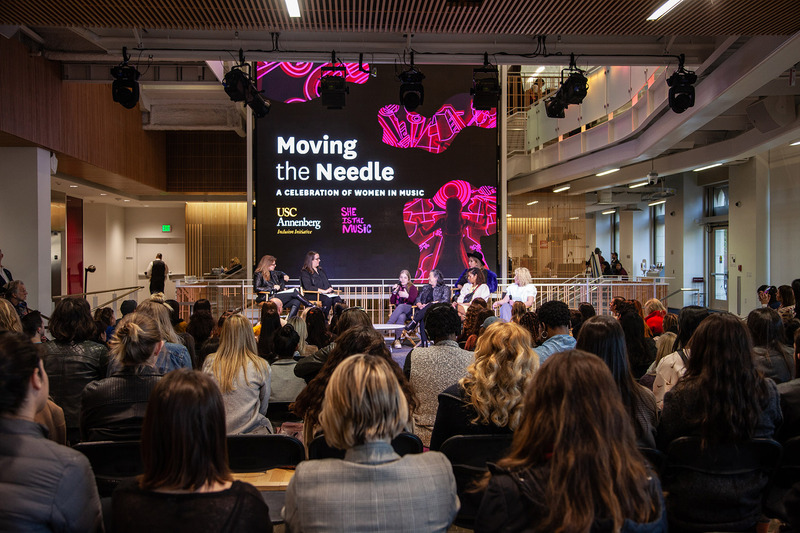 Beyond research, Dr. Stacy L. Smith and the Annenberg Inclusion Initiative are advancing practical, theory-driven solutions to the persistent lag in equality in media. These solutions offer real-world media professionals, performers, and even consumers the chance to get involved in addressing the problem and being part of sustainable change. Learn more about Dr. Smith's recommendations for individuals and organizations who want to end media inequality. The vision of The Music Coalition is to create diversity and inclusion in the music industry. The mission of the coalition is to engage and work with leaders and executives in the music space to cultivate an inclusive industry culture and business practices that advance equality among artists, musicians, and employees. Ultimately, the coalition will leave a lasting global footprint on consumers by ensuring that music is openly accessible to all. Dr. Stacy L. Smith is the Founder and Director of the Annenberg Inclusion Initiative at the Annenberg School for Communication & Journalism at the University of Southern California where she is also an Associate Professor. Dr. Smith’s work examines gender, race, LGBT status, disability, and age on screen and gender and race/ethnicity behind the camera in cinematic content as well as barriers and opportunities facing women and people of color in the entertainment industry. She also conducts economic analyses related to diversity and the financial performance of films. Dr. Smith is a world leader, with speaking engagements ranging from the TED Women stage to the United Nations. Her research sets the global standard for data on employment diversity in entertainment, and she is a trusted source to the entertainment industry. Dr. Smith’s work is cited widely by both corporate and educational audiences. Dr. Smith has written more than 100 journal articles, book chapters, and reports on content patterns and effects of the media. In 2015, LA Weekly named Dr. Smith the #1 Most Influential Person in Los Angeles. You can read more about Dr. Smith’s work and accomplishments in her full bio. Research and advocacy at this level involves multiple stakeholders. The Annenberg Inclusion Initiative is grateful to our existing sponsors and partners, including The David & Lura Lovell Foundation, Mari and Manuel Alba, Bonnie Arnold, Ann Erickson and Richard Pellett, Beth Friedman, Suzanne Lerner, Valley Fund for the Advancement of Women and Girls at the Women’s Foundation of Southern Arizona and Ann Lovell, the Women’s Foundation of Colorado and Barbara Bridges. Support is also provided by The Tides Foundation on the recommendation of Ms. Julie Parker Benello. Interested in supporting the Annenberg Inclusion Initiative? Please contact us for more information or click here to donate.